When we meet new friends and people in life, we learn a lot from their culture and get influenced indirectly. 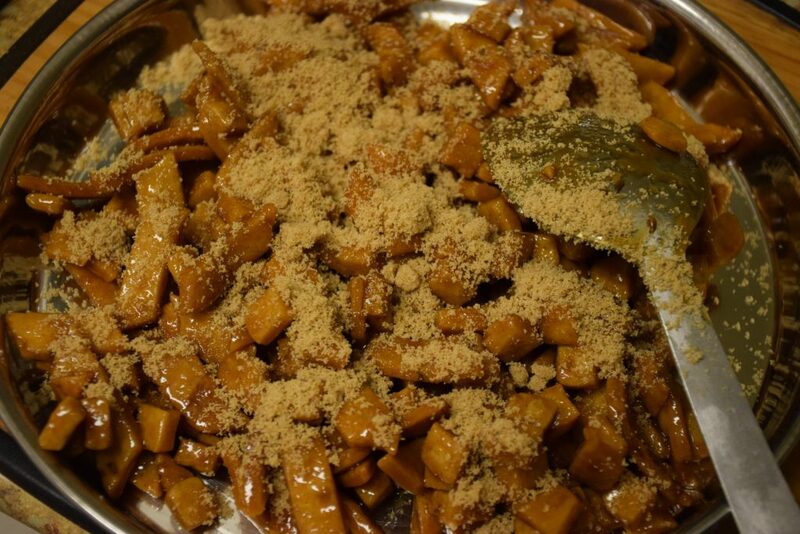 Jaggery is the basic sweet in some of my friend’s homes. 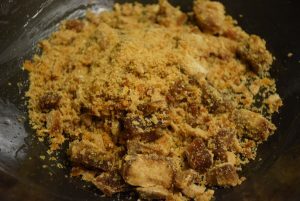 In my childhood days, I hated gur (jaggery) like anything. But after growing up, I realized the benefits of this amazing sweet. 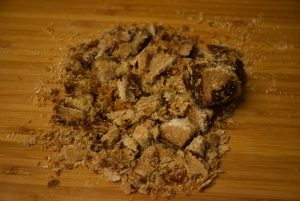 Jaggery (gur) not only is the crudest or purest form of sugar , but is also fibrous. 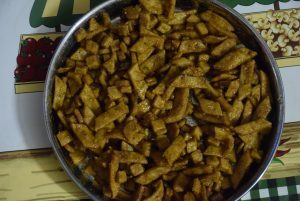 After trying the Gur ki panjiri suggested by my friend, I was tempted to try this recipe and thanks to the eminent bloggers ,I found this recipe and made them in my style. Moreover, I have always believed in controlling portions. If we can control and maintain our intake portions, then no sweet would ever harm us. But yes, those who suffer from diabetes have to avoid the sweets too often. This might come as a silver lining for them. 1. 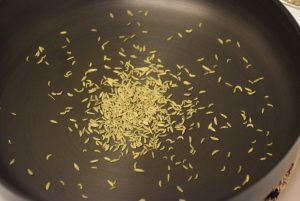 We start with dry roasting our fennel(saunf) seeds on a griddle (tawa) at medium heat. When you start smelling aromatic roasted seeds , turn off the heat and transfer them to a container. 2. Now take atta(whole wheat flour) and maida in a tureen(paraat). 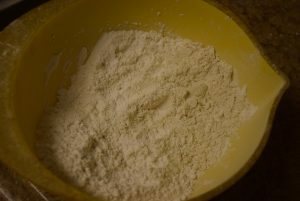 Mix the flours and make a well in the center. 3. 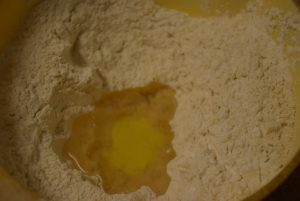 Add desi ghee(clarified butter) or oil in the center and sprinkle the saunf everywhere in the flour. 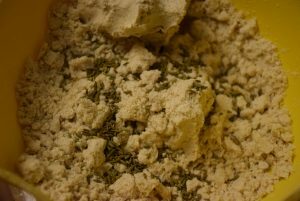 Mix the ghee in the flours ,such that when you pick some flour in hand , it forms a shape of your fist. In other words, it is of bread-crumbs consistency. 4. 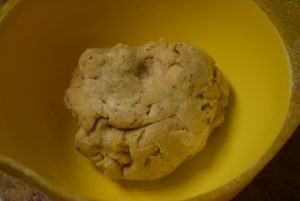 Start adding water to the flour and knead a stiff dough out of it. Add as little water as possible for crispier pare. 5. 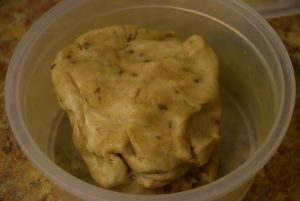 Cover the dough with a wet cloth and allow it to rest for 10 to 15 mins. 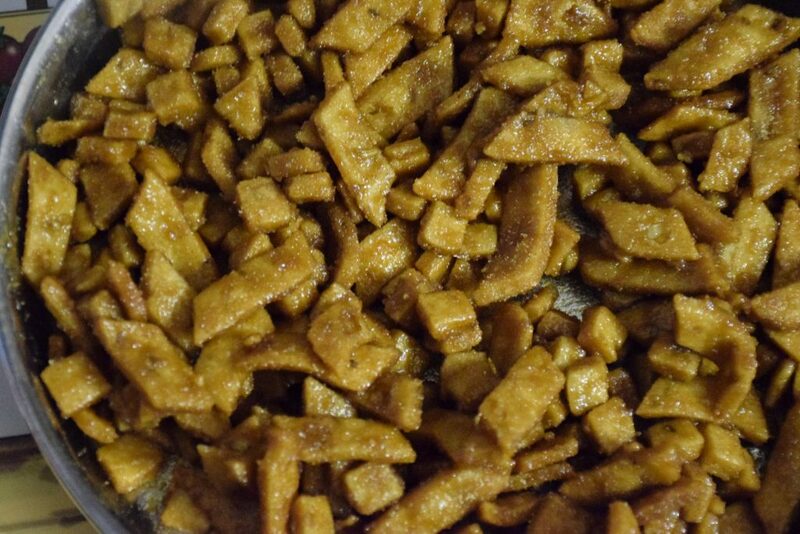 In the meanwhile, shred or cut the jaggery in fine pieces. This helps to dissolve it easily in less time in water. 6. 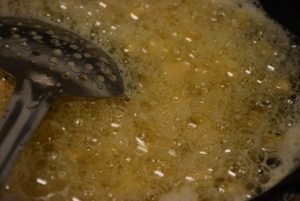 Uncover the dough, heat some oil or ghee in a wok for deep frying. Knead it a few times.Divide the dough into 2-3 big roundels (pedhas). 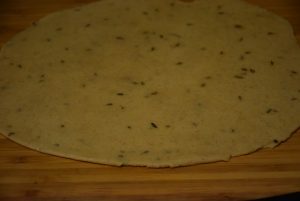 Place one piece on a rolling board or cutting board and roll it by greasing both sides of the roundel with a rolling pin (belan) to a thick parantha (almost 1/4 inch thickness). 7. 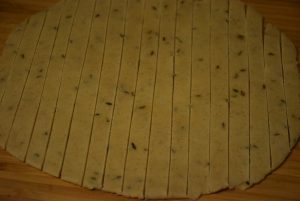 Using a sharp knife, cut the evenly rolled dough in vertical and horizontal lines. You may cut diagonally to get diamond shapes pare or at 90 degrees to get square /rectangle shaped pares. You may use some cookie cutters too , to add to ur and kids’ fun. 8. 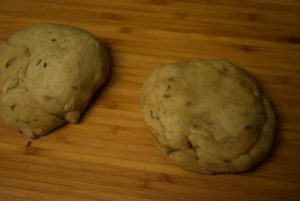 Check the oil, by dropping a tiny bit of dough in it. If it comes up slowly and sizzles , it is ready. The oil should not be very hot or very cold. It should be medium warm, so that you get them fried all over and the center cooked too. 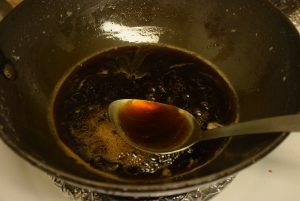 Don’t add too many of them in one batch, as it might reduce the oil temperature a lot and the pare would get hardened instead of getting crispy. Each batch can take between 8 to 10 mins to get fried on both sides. Turn them in between, when the sizzling of oil stops. 9. 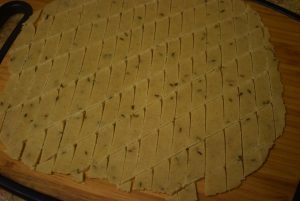 Take them out once done from all sides in a paper towel lined plate. 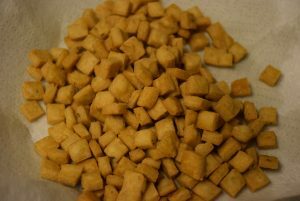 The perfect pare are swelled up on all sides with a brownish color and have porous core and crispy layers on the outside. Similarly fry all the pare. 10. 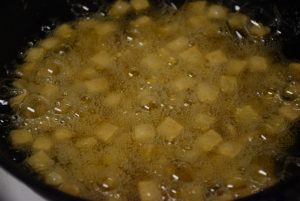 Now add the jaggery in the water and melt it at high temperature. 11. 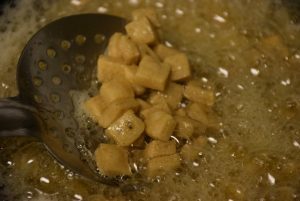 When the jaggery is all melted and forms a syrup, check for a 1.5 -2 string consistecy thread. Place a drop of syrup between 2 fingers and stretch it. If you see a thick strand and a small breaking strand , you can turn off the heat. Even if you see two long stretched strings, the syrup is good to use. 12. Now mix all the pare and the syrup in a big vessel or thali. Stir them continously to get them all coated in syrup on all sides. This might take 5-8 mins. Soon you will see the syrup is all dried up and soaked by the pare. 13. 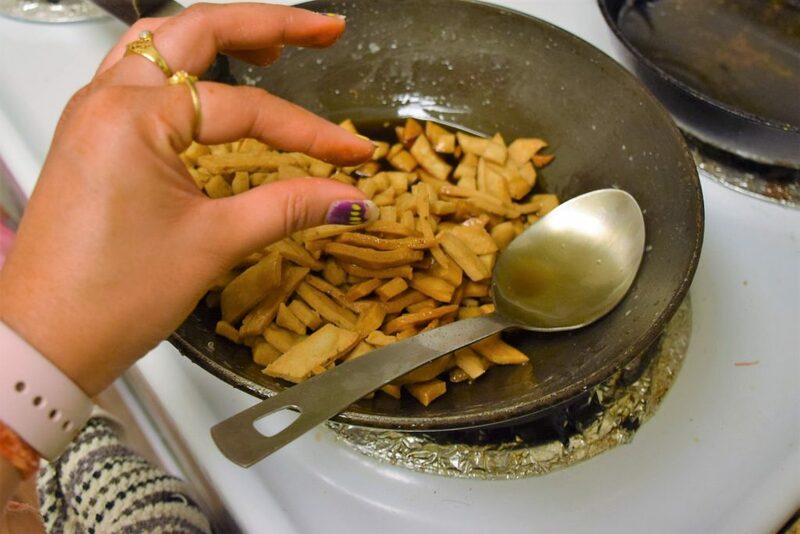 In the end, you may dust or sprinkle some light brown sugar or shakkar (jaggery powder ) all over them so that they don’t stick to each other and dry up faster. The delicious pare are ready to enjoy !! 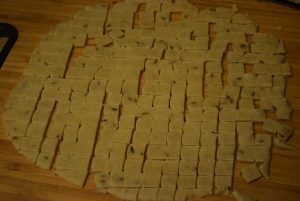 I prepared them for last Diwali . But in the wet winters, they taste amazing with a cup of tea too. Their fennel flavor, and addictive taste would tempt you for more !!! 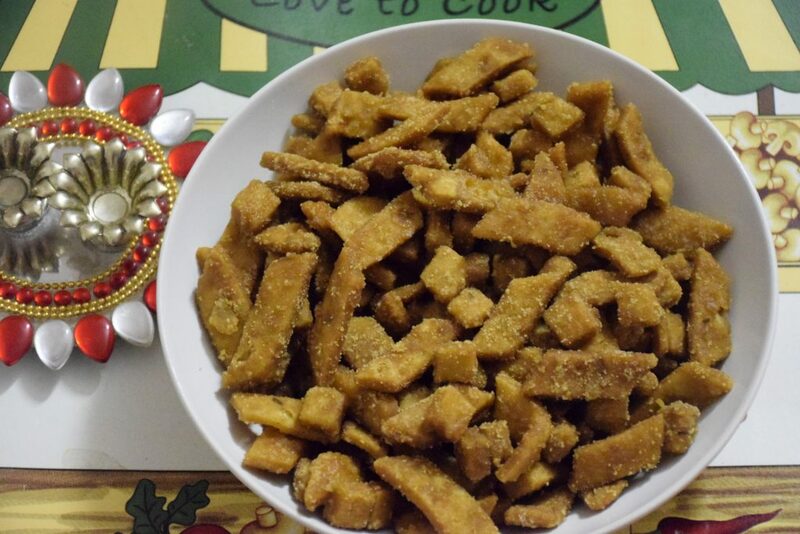 This entry was posted in Desserts, Diwali Delicacies, Food, Recipes and tagged bhuni, bhurbhura, Carenshare, controls sugar, crackers, diabetes special, Diwali special, easy on digestion, fennel crunch, fennel seeds, fibrous, filling, Gur, Gur ki Panjiri, healthy, Indian, jaggery, less sugar, low cholestrol, low sugar, North-Indian, online bloggers, pare, roasted, roughly coated, Ruchi ji, Ruchi's kitchen, saunf, shakkar pare, shweta jindal, squared, squares, sweet, taste bhi health bhi, zindagisikhati.